Need help getting fuel with a power card - Miata Turbo Forum - Boost cars, acquire cats. Hey guys, just bought a 96 miata with a jackson racing m45 on it. I guess its the gen 3 eaton because the front spacer from the nose to the housing is 1 inch thick. Anyways, I have the stock pulleys on the kit. I put a new bypass valve on the car, and ordered a bypass check valve. Im looking to get a little more out of the kit. I was thinking about going to a bigger nose pulley, but am scared i'll run lean. Can I just get a vortech FMU (8:1), and run it along with the powercard? Will the power card be able to calculate the duty cycles quick enough with an FMU attached? For reference I am only looking at running a nose pulley that is 65.5mm, which should be a total ratio of 1.99:1 for the pulley set ups. 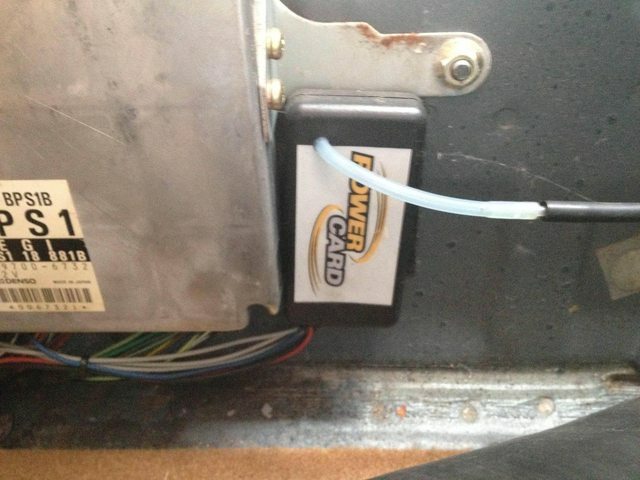 First post... you have a supercharger and a powercard? Brave man. Well if I was afraid of people being dicks, I wouldn't be on the internet. Why not sell the kit and get a basic turbo setup w/ proper engine management like a real man? Either way I hope you have a wb02 hooked up. **** that, I'd by a fox body before doing all that. Why not the FMU and NO Powercard? seriously. Im open to this idea if you think it is a better solution. Is there a reason you suggest going that route? which powercard do you even have? Is there some reason you want to throw money at **** bandaids instead of a real tuning solution? I hope it's emissions related. Yup emissions, and the fact that I have to have an operating ODBII port here. IDK what gen, I'll look it up. But here is a photo of it, until I write back. How do y'all feel about the AEM FIC? About the same as we feel about being raped by a bear with AIDS. Well, that's not entirely true. The Greddy eManage Ultimate and the Xede are not horrible. What kind of gains do people usually see going to the mega squirt (or any other stand alone). I started looking into the DIY pnp mega squirt. As far as the electronics go, it seems really easy. I am just a little on edge about tuning it. The plan so far, or what I acquired cheap on craigslist. The other option is to just go with the fuel pump, intercooler, pull timing, and run the power card. No one is going to convince you. If the numerous threads and posts on here from people switching and being happy are not convincing enough you just never will be convinced. That said, I personally tuned a few setups that switched from band aids to full EMS and the results were good. No record breaking power gains, but torque and smoothness was picked up just about everywhere. More control and precision means the car will be more enjoyable and efficient if tuned correctly. How hard is it to figure out the fuel maps, working off of the base map? I know they provide the spark tables, so thats nice. But I am worried about getting the tune right. I already plan to buy a wide band. I just know nothing past tuning a carb. Get used rx7 460cc injectors for $50 and you can copy my fuel map for starters. It is nice to have a little headroom. The autotune feature of TunerStudio tunes your MegaSquirt fuel map for you so you don't have to be adept at anything. It really is so easy that I could do it. The Mazdaspeed intercooler is so small that it isn't worth it. You need three of them to almost make a cheap chinese ebay intercooler. Before you jump off and buy a MSPNP, though, I would seriously consider the MS3 Basic being custom built by Reverent. SO NICE! Especially for the money. I'll look for the link on this forum. Reverent will install and ship it with a base map to match the size of your injectors of choice.